Friday, long-time US diplomats and Middle East experts Aaron David Miller and Richard Sokolsky published an article in Foreign Policy expressing “buyers’ remorse” over Saudi Arabia’s newfound willingness to take the lead in regional affairs. 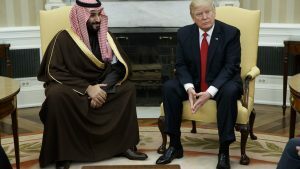 Titled, “Donald Trump has unleashed the Saudi Arabia we always wanted – and feared,” Miller and Sokolsky note that for generations, US policymakers wanted the Saudis to take a lead in determining the future of the region. But now, they argue, under the leadership of King Salman and his son, 32-year-old Crown Prince Mohammed bin Salman, the Saudis are going too far. Domestically, Miller and Sokolsky accuse Salman and Mohammed of upsetting the traditional power sharing arrangements among the various princes in order to concentrate unprecedented power in Mohammed’s hands. This, they insist, harms the status of human rights in the kingdom, although they acknowledge that Mohammed has taken steps to liberalize the practice of Islam in the kingdom to the benefit of women and others. While upset at the purge of princes, ministers and businessmen, Miller and Sokolsky are much more concerned about the foreign policy initiatives Mohammed and Salman have undertaken with everything related to countering Iran’s rise as a regional hegemon. Miller and Sokolsky note that Mohammed’s campaign to defeat the Iranian-backed Houthi regime in Yemen has been bogged down. His effort – backed by US President Donald Trump – to force Qatar to abandon its policy of supporting the Muslim Brotherhood and Iran has similarly come up short. As if synchronized, Robert Malley, Obama’s former Middle East adviser, makes a similar argument in an article in The Atlantic. Malley took a lead role in expanding the US’s ties with the Muslim Brotherhood, Hamas, Iran and Hezbollah during the Obama years. There are several problems with these policymakers’ claims. The first is that in criticizing the Saudis, they deliberately ignore the Obama administration’s central role in engendering the current situation in which the Saudi regime feels compelled to take the actions it is taking. To be clear, noting the role of the previous administration in causing the rapidly escalating instability of the Middle East is not an exercise in deflecting criticism away from the current administration. The simple fact is that it is impossible for the US to chart a rational course for dealing with the present dangers and opportunities without understanding how they arose in the first place. For eight years, the Obama administration deliberately alienated and willingly endangered Saudi Arabia and Israel by implementing a policy of appeasing Iran. Despite repeated warnings, the US refused to recognize that as far as Iran is concerned, it cannot have its cake and eat it too. Iran is at war with Saudi Arabia and its Sunni allies and with Israel. Consequently, Miller and Sokolsky’s claim that there can be an “equilibrium to America’s relations with Saudi Arabia and Iran” which doesn’t involve the US siding with one side against the other is an illusion. On the ground in the Middle East, as events in Syria, Lebanon, Qatar, Yemen, Bahrain, Iraq, Gaza and Egypt have made clear, Obama’s strategy of appeasing Iran weakened America’s traditional regional allies and strengthened Iran and its proxies. The change in the balance of forces that the Obama administration’s policy caused forced the US’s spurned allies to reassess their strategic dependence on the US. Contrary to Miller and Sokolsky’s claims, the Saudis didn’t abandon their past passivity because Mohammed is brash, young and inexperienced. Mohammed was appointed because Salman needed a successor willing and able to fight for the survival of the kingdom after Obama placed it in jeopardy through his appeasement of Iran. Mohammed is the flipside of the nuclear deal. Malley noted blandly that like the Saudis, Israel has also been sounding alarms at an ever escalating rate. It isn’t hard to understand why. In 2009, Israel’s borders and territory were far more secure than they are today. Sunday night three former senior missile developers at Rafael Advanced Defense Systems – Israel’s premier missile and missile defense developer – went on television to warn that Haifa’s oil refineries and plans to use surrounding areas as a fuel depot will force the evacuation not only of the population of Haifa, but of all the surrounding satellite cities when war breaks out next with Hezbollah. Hezbollah, they warned, now has the precision missile capability to destroy these vital national infrastructures and render the Gulf of Haifa uninhabitable. Israel has repeatedly insisted that Iran and its proxies must not be permitted to develop a permanent presence in Syria. Russia and the US ignored Israel’s warnings not only during the Obama years, but, in a sign of the continued power of Obama partisans in the US foreign policy community, during the past year of the Trump administration as well. Over the summer the US and Russia concluded a cease-fire deal for Syria that permitted Iran and its proxies to operate in Syria. Last week, the BBC reported that Iran is now building a military base 50 kilometers from the border with Israel. On Saturday, the IDF shot down a Russian- made intelligence drone launched against it by forces controlled by Iran’s chief Syrian proxy, Syrian President Bashar Assad. Sunday, following threats from Iranian-controlled Islamic Jihad terrorist forces in Gaza, Prime Minister Benjamin Netanyahu reiterated that Israel will not accept assaults against it across any of its borders. Netanyahu said that he holds the Iranian-supported Hamas regime in Gaza responsible for any attacks against Israel emanating from its territory. Netanyahu’s statement was notable since just last week Hamas and Fatah began implementing their power sharing arrangement in Gaza. Fatah forces, controlled by Palestinian Authority Chairman Mahmoud Abbas, supposedly took responsibility for border crossings between Gaza and Israel. 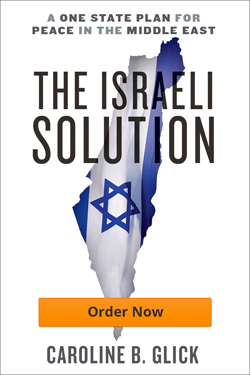 By insisting that Hamas is responsible rather than Fatah, despite the agreement, Netanyahu signaled that as far as Israel is concerned, through its power-sharing deal with Fatah, Hamas has succeeded in becoming the Palestinian version of Hezbollah. Just as Hezbollah pretends to be a faction in Lebanese politics, when in fact it controls all aspects of the Lebanese state, so Hamas remains in charge of all aspects of governance in Gaza while using the PA as a fig leaf. This brings us back to Miller, Sokolsky and Malley and their pining for a reset button. It is hard to view their positions as the basis for forging constructive US policies for the region, transformed by eight years of US appeasement of Iran at the expense of its allies and interests. Insisting that Mohammed abandon the steps he has taken to expand the prospects of Saudi survival in favor of a policy of pretending that a stable equilibrium can be struck between Iran and Saudi Arabia (and Israel) is not a policy for restoring equilibrium. Putting Hariri back in office in Beirut so he can continue to serve as a fig leaf for Hezbollah and Iran is not a policy for restoring equilibrium. They are both means for pretending reality away while enabling Iran to wage a continuous war against America’s allies with ever greater power and capacity. It makes sense that Obama partisans are unhappy with King Salman and Crown Prince Mohammed. It makes sense that they are unhappy with Netanyahu and with Trump. All four of these leaders are impudently insisting on basing their policies on recognizing the reality Obama spent his two terms ignoring: Iran is not appeasable.